All licensed vendors should review Alpha Sigma Alpha’s brand and graphic standards before beginning work on any Alpha Sigma Alpha projects. It is imperative to use our primary brand marks properly. 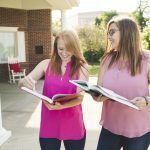 To view the Alpha Sigma Alpha Brand Standards Guide and other supporting resources, please visit the Preserving Our Brand section of the website. The Official Licensed Product Logo has been designed for Affinity Consultants’ clients. Once a vendor has joined the licensing program for Alpha Sigma Alpha, all merchandise bearing our name and symbols will be identified by this logo. Our affinity programs exist to benefit our chapters and members by providing membership services. A percentage of the profit of all purchases from licensed vendors is sent to national headquarters. This can potentially translate into thousands of dollars for the organization. If you would like to nominate a company to become licensed with our organization please email the company’s contact information to info@affinity-consultants.com. If you have further questions about these programs, contact the director of communications & marketing.